During the 1950 season, a number of minor league clubs, most notably the Pacific Coast League Hollywood Stars, wore uniforms featuring shorts instead of pants. But it was not until August 8, 1976, that a big league club gave the unusual style a try. 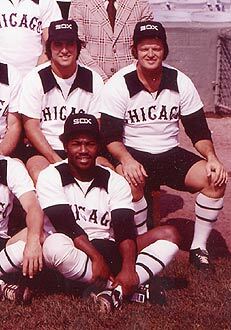 On that day the Chicago White Sox wore navy blue shorts in the first game of a doubleheader against the Kansas City Royals before donning pants in the second game. In 1976, the nation celebrated its bicentennial, while the National League celebrated its 100th anniversary. In honor of the “Senior Circuit’s” birthday, a number of clubs wore old-fashioned caps. Inspired by uniforms worn by National League clubs in the 19th century, pill-box style caps with horizontal stripes were donned by the 1976 Cardinals, Mets, Reds, and Pirates. Each of these clubs returned to their modern caps the following season, except for the Pirates, who adopted the old-time cap style through the 1986 season.